If you asked my husband years ago if he would even consider eating Roasted Red Pepper Hummus and like it, he would have laughed and told you absolutely not. Thick and creamy roasted red pepper hummus without tahini! Fast forward a few years and now he loves it! When most people think of hummus, they think of a bland, off-white, paste-like dip that looks like it would have little to no flavor. 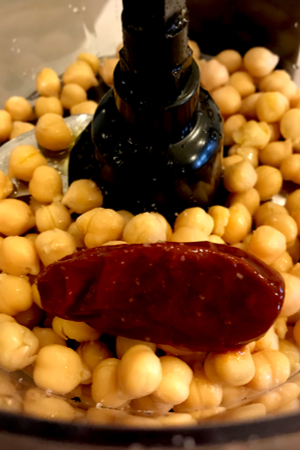 Pureed chickpeas flavored with a thick tahini paste isn’t the most appetizing dip for many people. However, hummus can take on a whole new taste when combined with other ingredients. 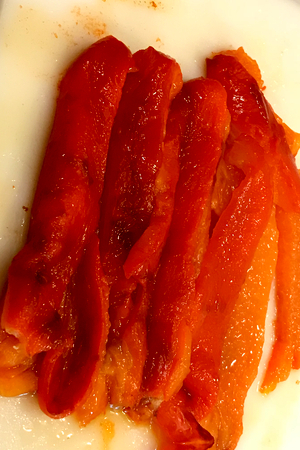 Fresh red roasted peppers – so easy to make your own! Roasted red pepper hummus and roasted garlic hummus are among the most popular flavors and can easily be found in most grocery stores. The roasted flavor of both the red peppers and garlic take traditional hummus to an all new level. So why not combine the two flavors and make Roasted Red Pepper Hummus with a roasted garlic flavor as well? That is exactly what I did in this recipe. Combined the two flavors and made the best tasting hummus yet! A roasted garlic clove ready to be added to the roasted red pepper hummus. In fact, it was so good, it was all gone within minutes when I served it at our work pot luck. So what are you supposed to use in this Roasted Red Pepper Hummus recipe – garbanzo beans or chickpeas? Actually, the terms are interchangeable. 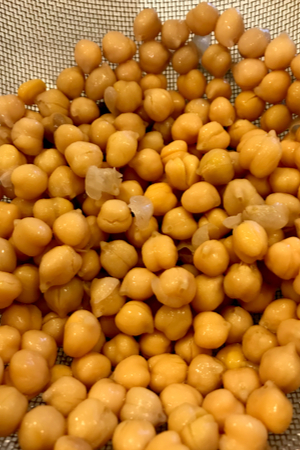 Garbanzo beans are the same thing as chickpeas. Be sure to rinse your garbanzo beans and remove any loose skins. Why are there two names for the same ingredient? Well, this is where a full-fledged history lesson could come in place. However, in an effort to keep it short, here is the basic reason. Location, location, location. Due to thousands of years of translation of language, the Spanish term is Garbanzo Beans. On the contrary the English term is Chickpeas. In the United States you will hear and see both terms used for this versatile legume. So don’t worry, pick up a can of garbanzo beans or chickpeas, either one will work. Traditional hummus is made with tahini, a sesame seed paste. It has a nutty flavor but also a somewhat bitter flavor that some people don’t like. Adding a chipotle in adobo sauce adds a nice smoky flavor to this dish. In fact, whenever I make Roasted Red Pepper Hummus for a crowd, I always omit the tahini. First of all, there are some individuals that are allergic to sesame seeds. Because tahini is a hidden ingredient in hummus, I don’t want the risk of someone eating it that shouldn’t. Also if children are present, I would prefer them to enjoy the taste of hummus, rather than indulging in cream cheese or ranch based dips. 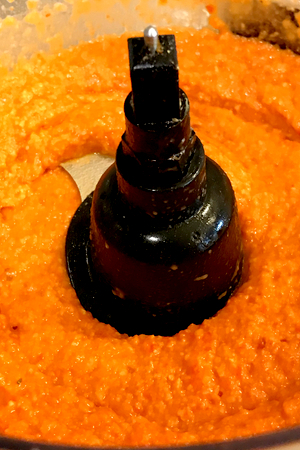 However, when I make Roasted Red Pepper Hummus for close family or friends, I sometimes add a couple of tablespoons of tahini. Use a food processor until you get the desired consistency for your hummus. It does add another depth of flavor to the dish and makes the hummus a little creamier than without it. But it is certainly not necessary. In most restaurants, the traditional way to serve Roasted Red Pepper Hummus is with pita bread. Pita chips and crackers are also common ways to eat this tasty dip. 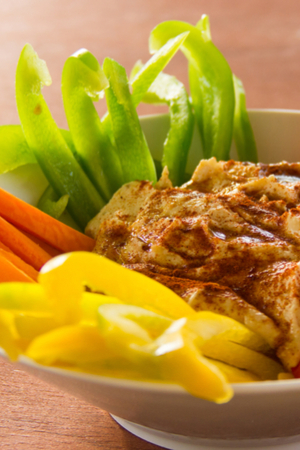 Our favorite, and healthy way to serve hummus – with veggies! Although, a growing and healthier trend is to serve it with vegetables. Sliced green and red peppers, cucumber and zucchini chips, and cauliflower florets are a great addition to a hummus plate. We even use the hummus as a base for veggie wraps. It is a great way to help hold veggies in place as you roll the tortilla shell into a wrap. 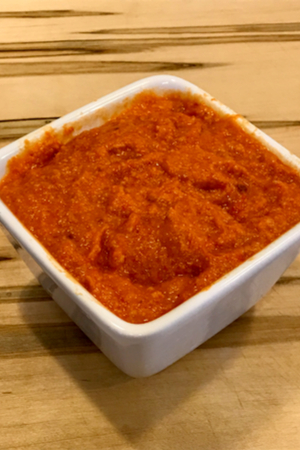 However you choose to Roasted Red Pepper Hummus, I am sure you will enjoy it as much as we do! 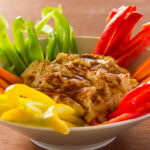 A healthy hummus dip full of protein and flavor using roasted red peppers and roasted garlic. No tahini required! Roast garlic by cutting off top 1/8 of entire bulb. 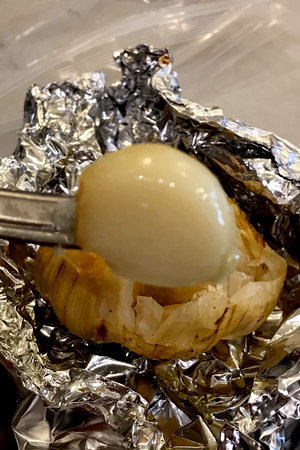 Place bulb on a piece of aluminum foil and drizzle the exposed head of the garlic with olive oil. Make a foil packet around the garlic and roast along with the red peppers. Drain the garbanzo beans in a colander. Rinse well and stir the beans with your hand to loosen any skins. Remove and discard loose skins. Repeat 3-4 times until most of the skins have been removed. Place all the ingredients in a food processor and process until the mixture is creamy and the desired consistency has been reached. Refrigerate for at least 1 hour prior to serving. Serve with veggie strips and/or pita bread or chips.